Do you find a trip to your local tackle store during prime salmon fishing season doesn't allow you to buy what you need to be a productive angler? Try ordering what you need online.  Avoid out of stock product and lineups and order as much of whatever salmon fishing tackle you want! It's a super efficient and easier way to buy tackle and chances are we'll have em' beat in price AND selection! While salmon fishing tackle is available at many different rod and gun shops, not just those on the ocean but also those inland, it's more convenient to learn about these things before you go ahead and purchase items. Let’s take a look at some of the tackle you’ll need for a successful day out there. Rods, reels, weight's, swivel's and salmon fishing line and leader are going to be your basic tackled needs on any salmon fishing excursion, whether on the ocean or in freshwater, casting or trolling. In all cases, your line is going to have to be of a good braid variety or "test"; extensive braiding brands are often referred to as super lines. These lines are good for casting, but when it comes to actually landing the fish, results can vary from company to company. For trolling in clear water, many anglers choose clear monofilament or fluorocarbon line. 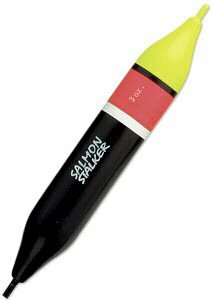 The unfortunate thing about salmon fishing is that if one of these big fish manages to snap your line, you are out some pocket money, not only for the line itself but also for any lure and attractant tackle that you happen to be using (and your bobber if you are bob or float fishing!). All that and nothing to show! Make sure your line is endorsed by fellow anglers before trying it out on the water. Ocean fishing for salmon, whether from a boat (mooching, trolling, or drift fishing) or from the shore requires some very specific salmon fishing tackle. You need hooks and weights that get the line down to the level that you want, but that also don’t pick up a lot of kelp on the way in. Bottom bouncers and lures work great for casting from a wharf or from the shore, and packed roe is one of the most successful baits. Remember that baits and lures for salmon are always based on smaller fish; bugs won’t get you a lot of bragging rights at the end of the day when it comes to salmon, unless you're talking crawfish which are commonly refered to by anglers as "bugs." As far as tackle and gear composition goes, it's a must to pay close attention to detail. Fishing rods and fishing reels should be made of a material that does not corrode, such as aluminum (common in high end reels), stainless steel, graphite (this is the most popular material in ocean fishing rods), plastic, or good old wood. Don’t use equipment that is made of mixed metals; different metals will react in different ways to the salt content, and you could end up with a reel or rod that is 25% corroded; it will look fine for the most part but it won’t work. Salmon fishing tackle considerations such as lures and bait will depend on the type of fishing you are engaging in. Fishing for salmon on the ocean will mean a lot of trolling. You will want a setup of rod, reel, and line appropriate for trolling, preferably one that can shake or “flip” piles of seaweed off so that the weight of the fish on the other end isn’t compounded by the weight of debris. The bait on the line is usually going to be a fish simulating device, perhaps with a few spoons to catch the eye of the salmon. Plugs are also common on the ocean when salmon fishing. It’s important to check regulations for the area you are fishing so that you don’t use a hook/lure combination that is illegal (years ago quadruple hooks were common, but regulation has meant that double hooks are now the norm in fish-like lures). Freshwater salmon fishing will usually mean the use of floats and live bait such as roe or prawns. This might sound like a tame way to fish, but it can be quite a rush to see that float sink in the river and realize that it might not just be a rock, but a massive Spring salmon on the end. Check the rod quick, because you will want to hook the fish before he realizes what is going on. This is done by a quick firm "jig" or set towards you. Slowly let your tip back towards the river with the current keeping some tension on the line, and if it keeps going down, give it another real good jig and yell "fish on" if you've got something. Casting, in freshwater can be one of the most rewarding salmon fishing experiences, especially when the costs are weighed against those incurred fishing from a boat. The tricky part can be in determining the right kind of flies or lure's; in fact, the only type of salmon that is really going to bite on a fly are Steelhead or Coho. The flies you are going to be successful on for steelhead will depend on whether the fish are winter or summer run, and of course the kind of bugs that are around the river or stream you are casting on. The real challenge in casting for steelies is just getting the fish to bite on any flies at all. If you decide to use a lure or blade, this is a very productive way to fish for a wider range of salmon and can be used in both saltwater and freshwater. Bottom bouncing is also a casting method used in a river system and involves lots of casting. In these methods, live bait, synthetic worms and wool are the weapon of choice by most anglers. When targeting Coho or steelhead a smaller rig is used as these fish can be easily spooked off of a huge and intimidating set-up. A couple of split-shots (or small amount of lead) and a nice compact presentation that is "stealthy" will work well for you for these two species. If your out for the Spring or Sockeye in a large river system like B.C. 's Fraser, or the Columbia, you’re more likely to use a larger bouncing betty and some wool while you "floss" the mouth of the King salmon, as these fish moving up the river to spawn are going to be attacking your line rather than biting it because they want to feed. Flossing is a productive way to fish that brings a good table fare, but uses much less skill than other methods and some anglers disapprove of this method. Excalibur is a leading manufacturer of "bouncing betty" type weights that are in the midst of lead weight replacement, which is harmful to the environment. These environmentally safer weights use "Tungsten nickel alloys" and are 25% smaller, denser and more rigid, which means longer life, less likely to damage lines and more effective in river systems as they transmit a better bounce to the line! VERY COOL! 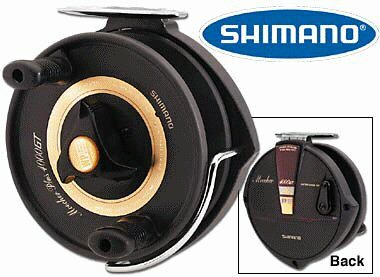 Reels for salmon fishing are usually spinning or baitcasting reels. They need to have smooth drag systems and should keep the actual act of reeling thoughtless. The tension between fish and reel should be smooth and not a "jarring" tension that can cause the line to snap. Since you will want to concentrate on the fish on the other end and not the actual reeling process, drag becomes very important when deciding which reel is best for you. There are different schools of thought when it comes to the right type of fishing line to use as far as your salmon fishing tackle is concerned, but in most cases the more expensive line is the best option because as my dad always said "you get what you pay for." Now, it doesn’t have to be the MOST expensive fishing line on the market, but higher priced lines tend to be best for clear water fishing; the less visible line will not spook a fish off of your bait. More expensive lines are also more resistant to breaking, kinking, and tangling. More times than none you are going to be paying for a new technology as the older technologies move by the wayside.